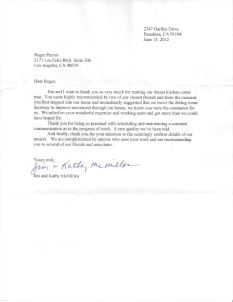 McMillen » Roger Perron Inc.
Jim and I want to thank you so very much for making our dream kitchen come true. You came highly recommended by two of our closest friends and from the moment you first stepped into our home and immediately suggested that we move the dining room doorway to improve movement through our house, we knew you were the contractor for us. We relied on your wonderful expertise and working team and got more than we could have hoped for. Thank you for being so punctual with scheduling and maintaining a constant communication as to the progress of work. A rare quality we’ve been told. And finally, thank you for your attention to the seemingly endless details of our project. We are complimented by anyone who sees your work and are recommending you to several of our friends and associates.